1918: Joe Malone doesn’t score in the Montreal Canadiens’ 5-3 season-ending loss to the Toronto Arenas, but he finishes the first NHL season with a League-high 44 goals in 22 games. It’s an NHL record that stands until 1944-45, when Maurice Richard scores 50 goals in 50 games. 1966: Bobby Hull of the Chicago Blackhawks becomes the NHL’s first two-time 50-goal scorer. Hull gets No. 50, matching his total from 1961-62, when he scored against Hank Bassen at 5:15 of the third period in a 5-4 win against the Detroit Red Wings at Chicago Stadium. 1969: Phil Esposito becomes the first player in NHL history to have 100 points in a season when he scores two third-period goals in the Boston Bruins’ 4-0 victory against the Penguins at Boston Garden. The milestone comes one night after he breaks the single-season points record of 97 held by Stan Mikita of the Blackhawks. 1976: Bryan Trottier of the New York Islanders ties the NHL rookie records for assists (52, by Jude Drouin) and points (77, by Marcel Dionne) with an assist on a second-period goal by Billy Harris in a 2-1 victory against the California Seals at Nassau Coliseum. Drouin, now a teammate with the Islanders, scores the winning goal in the third period. 1991: Brett Hull becomes a 70-goal scorer for the second straight season and has three assists to help the St. Louis Blues earn a 4-4 tie against the Flyers at the Spectrum. Hull finishes with an NHL career-best 86 goals, the second of three consecutive seasons he reaches 70. 1993: Mario Lemieux and Teemu Selanne each has a night he’ll never forget. 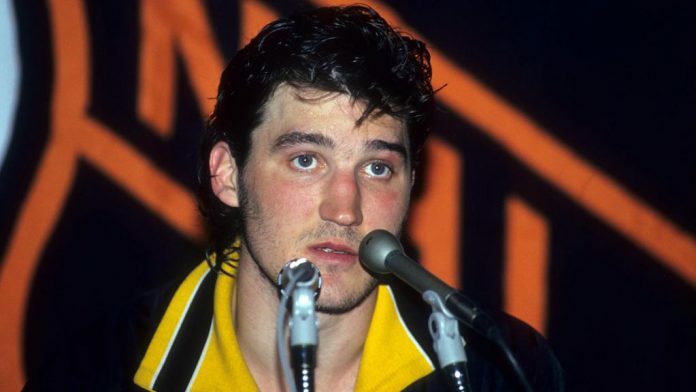 Lemieux starts his day in Pittsburgh finishing his 22nd and final radiation treatment for Hodgkin lymphoma, then joins the Pittsburgh Penguins in Philadelphia and has a goal and an assist in a 5-4 loss to the Philadelphia Flyers. Lemieux’s return is a surprise even to his own teammates, and he’s bathed in applause by the Spectrum crowd when he stands near the boards before the national anthem. Amazingly, though Lemieux hasn’t played since Jan. 5, he scores a goal, his 40th of the season, 1:54 into the second period against goaltender Dominic Roussel. He assists on a goal by Kevin Stevens 1:35 later. Despite Lemieux’s return, the Flyers win 5-4. Selanne breaks the NHL record for goals by a rookie, passing Mike Bossy, by scoring three times for the Winnipeg Jets. Two nights after scoring four goals to become the third 50-goal rookie in NHL history, Selanne stays hot against the visiting Quebec Nordiques. He scores his 52nd of the season 15 seconds into the game and ties the mark set by Bossy in 1977-78 late in the second period with his 53rd. With the crowd at Winnipeg Arena rocking every time he steps onto the ice, Selanne breaks the record at 9:26 of the third period. Tie Domi lobs a long, high pass from his own zone; Selanne evades defenseman Adam Foote, gets to the puck before goaltender Stephane Fiset and chips it into the net for No. 54. The game stops as the Jets pour off the bench to mob Selanne. The one thing Lemieux and Selanne have in common is the outcome. Though Selanne’s goal gives Winnipeg a 4-3 lead, the Nordiques rally to score four goals and leave with a 7-4 victory. 1995: Joe Mullen becomes the second NHL player to appear in 300 NHL games with three different teams when he plays (and scores a goal) for the Penguins in a 6-3 loss at the Buffalo Sabres. Mullen goes on to play 379 games with Pittsburgh after playing in 301 with the St. Louis Blues and 345 with the Calgary Flames. He matches the record set by Bill Gadsby, who plays in 300 games with the Chicago Blackhawks, New York Rangers and Detroit Red Wings from 1946-66. 2000: The St. Louis Blues become the second team in NHL history to win 10 straight games on the road when they defeat the Atlanta Thrashers 5-2 at Philips Arena. Pavol Demitra scores his 100th NHL goal to help the Blues tie the mark set by the Sabres in 1983-84. On the same night, Mark Messier of the Vancouver Canucks scores a goal in a 3-1 victory against the visiting Mighty Ducks of Anaheim to become the fourth player in NHL history with 1,700 points.